See the sights of Las Vegas when it really comes alive – at night! 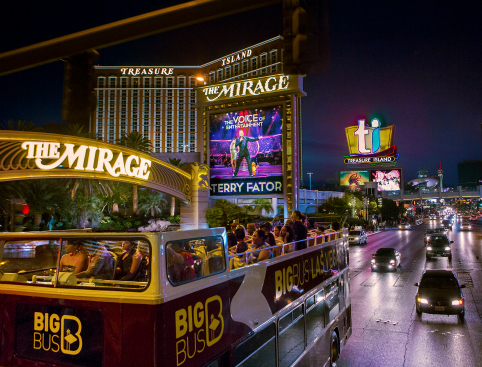 Head down the dazzling Las Vegas Strip. 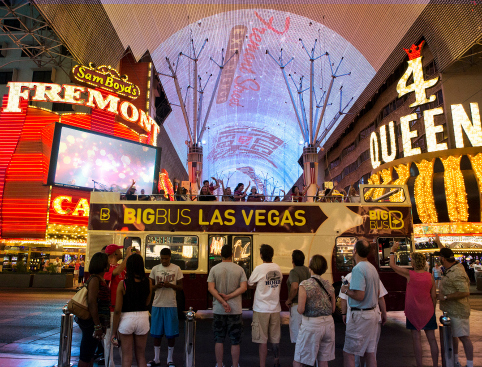 Enjoy a short guided walking tour from the Golden Nugget to the Fremont in the downtown district. Please bring your printed e-ticket with you and present it to a member of Big Bus staff at your boarding point. Please note that you may be asked to show proof of ID. What: Night tour of Las Vegas. Don’t Miss: Seeing Las Vegas in all its glittering glory in the company of someone who knows it’s secrets. Las Vegas is great at any time of day, but it really comes alive by night! 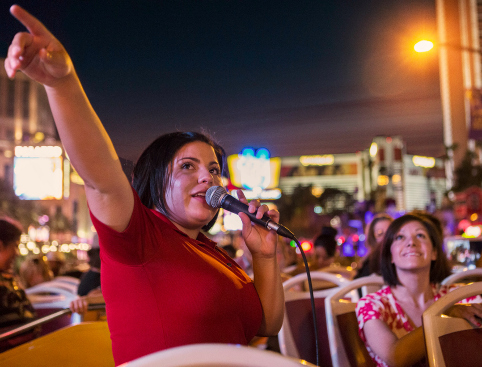 On this tour you’ll get to see all the after-dark highlights of Vegas by bus, PLUS you’ll also be taken on a short walking tour of the downtown district. Get ready to be bedazzled! 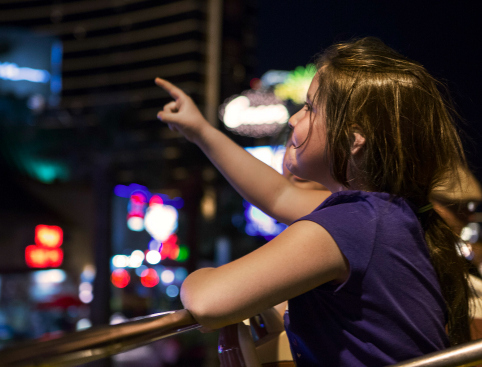 This night-time tour takes you down the dazzling Las Vegas Strip to The Excalibur, with dancing fountains, swashbuckling pirate shows and erupting volcanoes along the way! From here the tour heads south to one of the most famous sights in Las Vegas - The “Welcome to Fabulous Las Vegas” sign. Weave through the heady crowds of Las Vegas Boulevard, all the way downtown to stop at the Golden Nugget for the incredible Fremont Street Experience. Here you’ll have the opportunity to leave the bus for a short guided walking tour. The tour culminates at the world-famous Fremont light and sound show - the live entertainment, artist’s kiosks and costumed entertainers that the downtown district has become famous for! 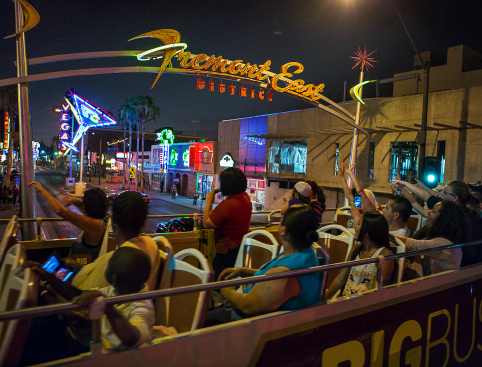 Your tour guide will ensure that you experience the very best of downtown Vegas, before returning to the bus to head back to the Strip. 7pm from Circus Circus, 7:15pm at LINQ Promenade High Roller or 7:30pm at Excalibur. Unfortunately there is no wheelchair access on this bus tour. Las Vegas Night Tour is rated 4.5 out of 5 by 2. Rated 4 out of 5 by Anonymous from Only problem was that bus did not stop at any of the famous points to give opportunity to take pics with the exception of Froment st.